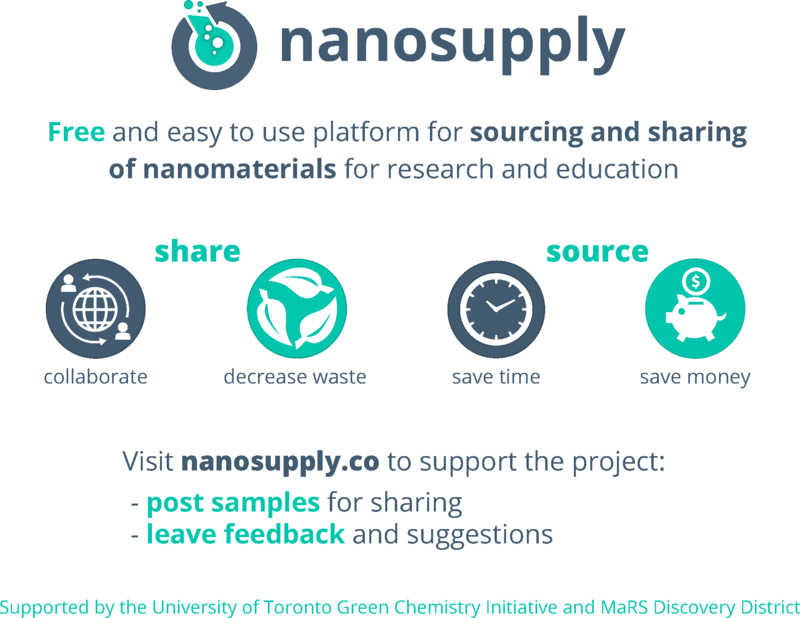 nanosupply.co is a free online resource that provides an opportunity to find and share information about nanomaterials in academic labs available for collaboration or donation for research and/or educational purposes. Labs that synthesize nanomaterials can post information (including microscopy images and other characterization methods) about samples that are not any longer needed for a project and are available for donation, or nanomaterials which synthesis is well established in the lab and therefore can be produced for collaboration. Scientists that are looking for specific nanomaterials for their projects can search through these posts and contact the lab that synthesized the material for further discussion. Regarding the transfer of materials between labs, we provide general guidelines and a short material transfer agreement template on the account page. We also discuss material transfer, open science and green research practices on our blog page at http://blog.nanosupply.co/. You can read a article about nanosupply on ACS Green Chemistry Institute blog to learn more about this initiative: http://goo.gl/Q4nMnU/.